Related coverage: <a href="http://thegoldwater.com/news/42088-Australia-PM-Morrison-Slams-Radical-Violent-Extremist-Islam-Video"> Australia - PM Morrison Slams ‘Radical, Violent, Extremist Islam’ (Video)</a>. 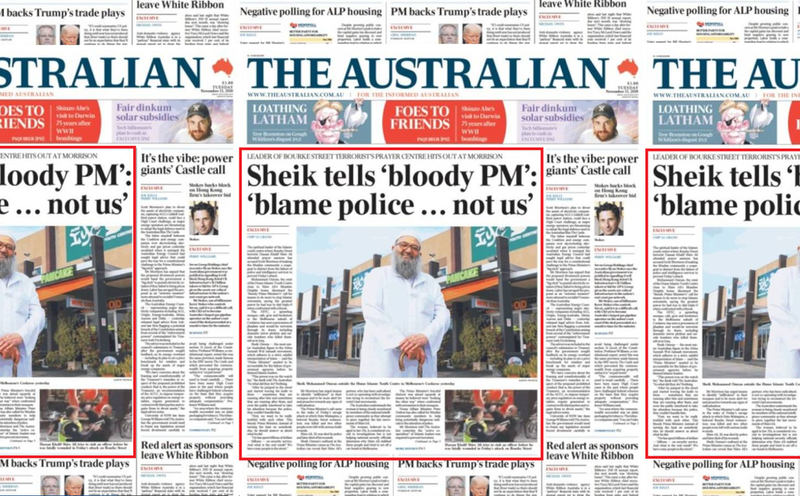 Sheik Mohammed Obran’s spokesman, Mr Mustafa Abu Yusuf said this morning that the Hume Islamic Youth Centre had been in contact with the AFP, but that police had labelled the Friday attack prematurely as terrorism. Mr Yusuf denied any links between the centre and terrorism and said they did everything in their powers to combat extremism. “Victoria Police have had Shire Ali under scrutiny for so long so why are they beating up us? You don’t fund us, help us, you get in the way of us,” he said. Technically, they're right. The entire belief that Islam is something to be obeyed and worshipped, is INSANE! I mean, who in their right mind would think that Muhammad was a good man and everyone should follow his words and ways? Who in their right mind would be loony enough to believe there are 72 virgins waiting in heaven for them after they prove their worth by slaughtering innocent people. Yes, the entire doctrine is insane. Its entire following is sick in the head. Islam is in itself, for the mentally retarded to follow. And don't get me started on women converting to Islam. They have truly lost their minds, wanting to be a part of a culture that loathes, abuses and disrespects women. Regardless of these fine examples of "mentally ill", these are TERRORISTS and they are out to kill. So would anyone rent a room with a mentally ill person with violent murderous thoughts? Doubt it. No excuses. They need to go! Australians & Canadians put PC over political action & have looked down their nose at Americans for being so engaged. My best buddy is Australian & I can't just walk away from any western culture but watching them give away their countries makes me want to give them back the 'ol 'piss off mate'. YES EXACTLY!!! THEY ARE ALL LUNATICS!!! WHO TURNED THE TRUTH OF GOD INTO A LIE??? THE LUNATIC LEFT AND THEIR INSANE ALLIES!!!! MURDERERS THE LOT OF THEM!!! !THEY WORSHIP DEATH AND DESTRUCTION!!!! THERE IS NO LIFE IN THEM!!!! DEATH AND DESTRUCTION IS THEIR GOD!!! CONFUSION AND DIVISION ARE THER WEAPONS OF MASS DESTRUCTION!!! THE GOATS AND THE SHEEP. WE ALL KNOW WHO THEY ARE!! !